For the past few weeks I have been working on the music soundtrack for Lee Hardcastle's supercharged new claymation movie, Ghost Burger! This is the third movie on which I have worked with Lee, and it is definitely the most ambitious so far. It's just under 25 minutes long, and is a hyper-real daydream of stunning animation, colourful lighting and camerawork. 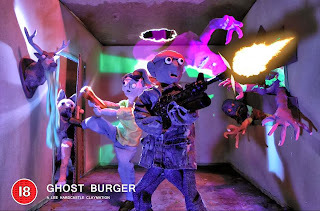 More about the work on the soundtrack in a later blog, but for now - enjoy Ghost Burger! When Halloween was first screened on TV in the UK (1981/ ’82 I think) I was utterly blown away, and so deeply affected by the movie that it gave me nightmares into my teen years. After this, I saw Escape From New York on VHS, that was it - I was irrevocably hooked on his movies, and thoroughly addicted to his scores. Particularly from 1976 through to 1988, Carpenter wrote, produced and directed some totally unique, defining pieces of work which are today regarded by many as modern classics spanning different genres. 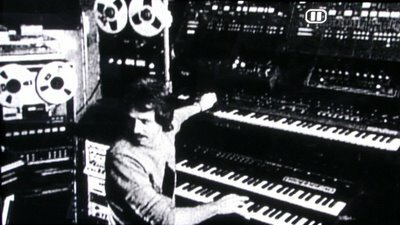 One of the most unique things, is that Carpenter was of course equally recognised for providing signature electronic scores for his own productions. The earlier scores were originally very minimalist (Assault On Precinct 13, Halloween, The Fog, Escape From New York, and also some of the incidental music from The Thing) but began to become more far complex with Halloween 3, Christine, Big Trouble In Little China & Prince Of Darkness) incorporating complex sequencing and very intricate harmonies. As the 80s were drawing to a close, Carpenter began to see the beginnings of a critical decline that was to become more evident in the 1990’s, however there is no denying that he irrevocably changed the look and sound of his generation of film. For almost 15 years though, the soundtracks to his movies were very special indeed, and as uniquely emblematic as the films themselves. My Walkman was always my best friend - and was always there whenever possible - day or night. I would privately listen to movie scores and Carpenter's electronic pads and signatures while other people were listening to whatever was pop at the time, and that was fine with me. As homage (and also because I really enjoyed working on them) I have put together my own arrangements of some of my favourite Carpenter's themes. For the most part, I have tried to be as faithful as possible to the original pieces, but there are a few personal touches here and there. Intro: Nostalgia Lights The Way. Hello there, and sincere greetings to anybody reading this far . . I hope this first blog finds you well. As a kid, I adored music and movies. For the last few years, I regard myself as very blessed in that I have been composing music for film and media, - as well as touring as a hired musician for other artists. Unfortunately, somewhere along the way, I realised that had completely forgotten most of the things I used to love about music. It’s enough already that we are subjected to a constant diet of negative messages every single day from TV and the internet. A present where everything seems to be about fear, bias, ownership, greed and control - and many of the people who claim to fight against the system - ARE the system. Sometime, somewhere on tour, I realised that much of the music around me was about themes I just couldn't really subscribe to anymore, and that's not how it was supposed to feel. I went to see a show in the summer of 2012, and everything suddenly became much clearer. It was how I used to feel all over again. The music just jumped right out. No darkness at all - and it was perfect. There is no music about aggression, violence or killing here. There is no music about war or hatred here. There is no social commentary here, and politics do not exist.